When reading this novel, the words meditate, ruminate, and reflect all come to mind—a contemplation of the meaning of our lives, on loss and how we can deal with it in an increasingly secularized and fragmented world where the traditional comforts of family, religion and the "old ways" are disappearing. Little happens in the plot, the author does not venture into significant social commentary, nor do the characters achieve any great inner transformation, and yet, when the book is finished, there's a sense that we have been somewhere significant and grappled with something substantial, all encapsulated in beautifully-written prose. This is, primarily, a story about loss. It opens (after a short preview of the book's ending) with the theft of a small collection of seashells from Helena Verbloem, the highly-obsessive narrator. While, to most people, the theft is minor, to Helena it is a consuming event that takes over her life. Meeting with relative indifference from the police, she sets out to uncover what happened and, most of all, why. As the story progresses, the theft becomes shorthand for all the other losses in her life: a professional life documenting the Afrikaans words and phrases that are disappearing; family members who walked away or died; an abandoned writing career; lovers gone and coworkers who die. Even her memory becomes a culprit as Freek van As, a man she really does not remember, calls to chat about events that happened to the two of them in the past…events about which she has only the haziest, if any, recollection. A theme emerges suggesting that everything in life is transitory and that any effort to fix a particular instant or to depend upon a particular circumstance is doomed to disappointment. Helena's response is to become obsessed with understanding the reason for her losses. Why take her shells, and why take nothing else of value? What was the chain of cause and effect that produced her family? Why did her life—actually, Life with a capital letter—get this way? There are no easy answers in the story. By the last page Helena hasn't discerned a pattern or plan, and neither has the reader. It's as if Winterbach asked all the questions and then declined to answer any of them. And yet, I think there is an answer there. In a way, I think the translation of the title from Afrikaans to English has taken away one of the clues. Looking at the original title, Die Boek Van Toeval En Toeverlaat, you can't help but notice that it seems to end in two nouns, not one. An online dictionary translates the second as something with connotations to the English words mainstay, refuge or anchor. Read with that in mind, this becomes not just a story about happenstance, but a story about anchoring oneself against that sea of chance because you cannot predict it. As Helena says, "I do not see my destiny as determined by providence, but rather as the convergence of a hundred, of a thousand and one minor coincidences." The story is full of vivid characters, moments of quiet humor, and the occasional peek into South African society for those of us who do not live there. 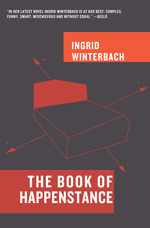 Winterbach's prose is a joy to read, even in translation (which she helped perform). She, herself, has said, "You know you will always lose something of the original work. In translation you win some and you lose some. But I would rather lose some of the nuances than not be translated at all." I agree completely with that final statement.